The mornings at our home is always the most stressful part of my day. I mean- wake up, brush teeth, comb hair, make bed, eat breakfast, put on shoes, grab backpacks and finally out the door! phew, I feel like I’ve run a marathon by 9 a.m. and the day has barley started! Normally I’ll go with the fastest option for breakfast while I quickly prepare lunches and in between try to get a few sips out of my coffee cup. However, every once in a while I try to de-stress our mornings and decide to wake up extra early and prepare a yummy breakfast. It usually doesn’t last more than just a few days but it definitely feels good and we all enjoy it while it lasts. Of course you want to start of the day with a good, healthy meal. 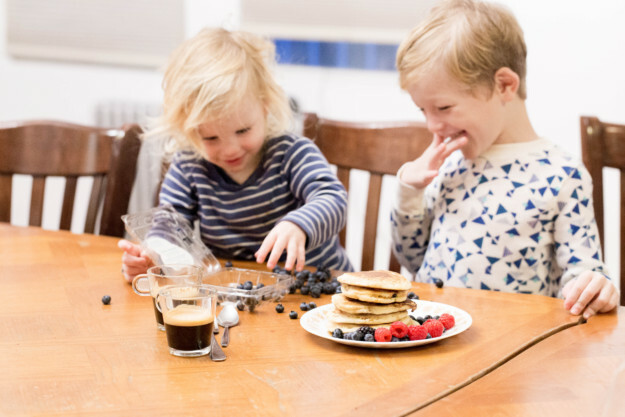 However, anyone with kids knows that some mornings are just too special to worry about a properly balanced meal. 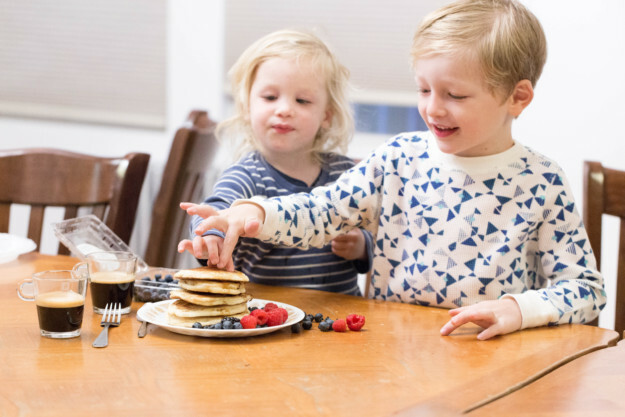 Spending time in the kitchen as a family, whipping up something absolutely delicious and sweet, is the stuff that memories are made of. 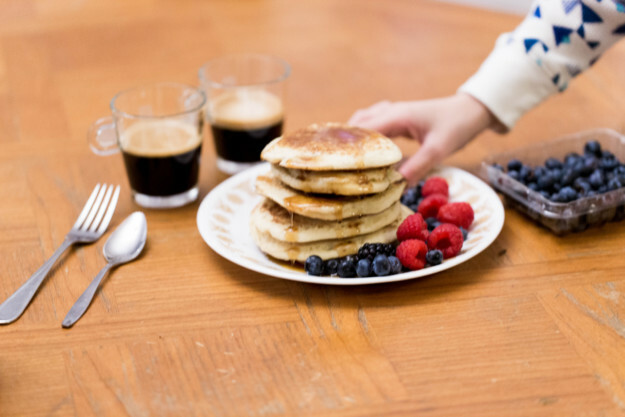 Sometimes it’ll be cinnamon rolls or french toast but pancakes are the kids absolute favorite and they love it with berries and maple syrup on the side. 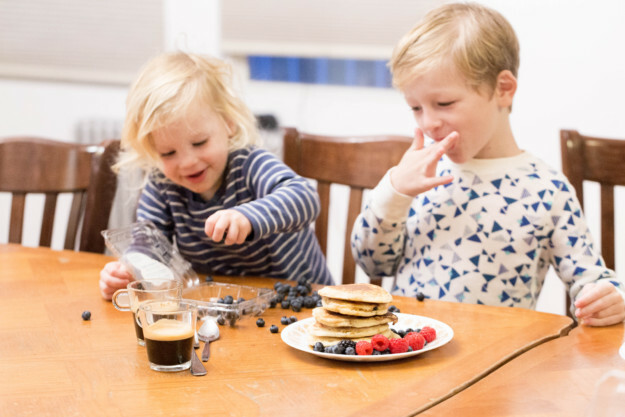 Here is an easy pancake recipe introduced to me by my sister in low, who has some amazing recipes on here blog here. Heat a large skillet over medium-low heat. In a bowl, mix together dry ingredients then add the rest of the ingredients to the bowl and mix well. Place a teaspoon or 2 of butter or oil on skillet. 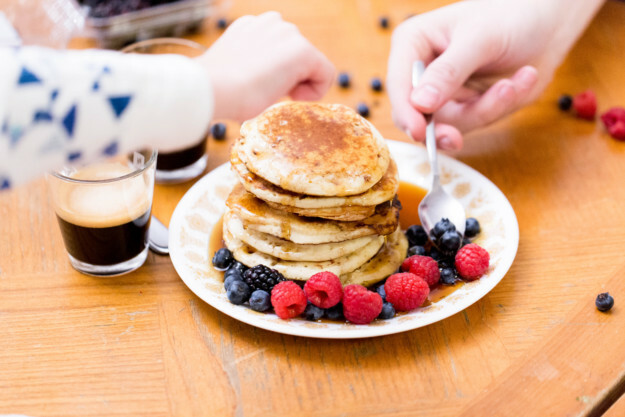 When butter foam subsides or oil shimmers, ladle batter onto the skillet, making pancakes of any size you like. Adjust heat as necessary; usually, first batch will require higher heat than subsequent batches. 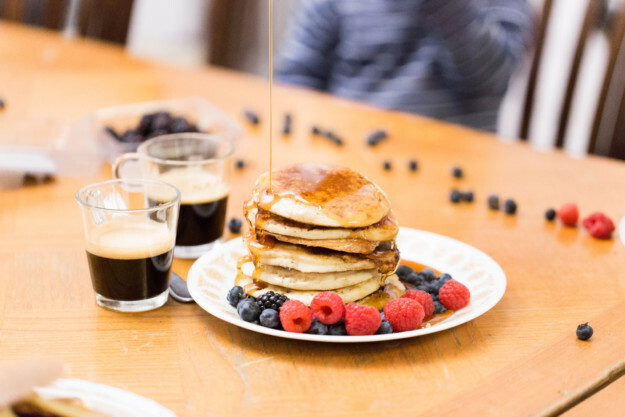 Flip pancakes after bubbles rise to surface and bottoms brown.